GUALFIN, ARGENTINA – Today, we leave the world of overpriced stocks and claptrap politics behind. Instead, we will just tell you what happened over the weekend here at the ranch. Monday was May Day in Argentina, as it was in much of the world. It was beautiful autumn weather here in the Calchaquí Valley. The golden leaves on the alamo trees barely stirred. The sky was bright blue. The temperature was perfect. “The valley is known for its hospitality,” John explained. We were not just hearing about it. We were living it. If you’re not preparing for a market crash right now… WAKE UP. We’re in the middle of the biggest stock market bubble in history. When stocks finally crash, you could make a fortune if you’re prepared. Like one man we read about who made $1 million in 24 hours. We recommend you do this as soon as possible. Full details here. John grew up in Alabama. He became a Spanish teacher and moved to Argentina some 30 years ago. He is still here, running a charming hotel – El Castillo – outside the city of Salta. “You remember Ashley?” he went on. Ashley, another American, had grown up in Ohio, married an heiress, divorced, and ended up in one of the most remote ranches in Patagonia. “I went to visit him. I flew down to San Martín de los Andes. Then I drove for four hours until I got to a tiny little town. Ashley kept horses there. “I got on the horse, crossed a river that came up to your chest, and then rode for another two hours. Finally, I got to the house. It was beautiful… up on a bluff overlooking the river. Along with John was a Dutchman, Jan, who owns a large and serious farm along the river, and Colin, an Irishman who is helping to set up a brewery in Salta. We offered him the only beer we had on hand, a Budweiser. Also in the group was a couple, Clara and Oskar, who had shown up at our door unannounced the day before. As we explained yesterday, Oskar is an Austrian on an around-the-world trek in a Toyota. Clara is a local woman, a relative of our closest neighbor, Raúl. We didn’t know where they were going, but wherever it was, it was a long way away. So, we invited them for dinner and to spend the night. In the evening, we gathered around the fire in the living room. After a few bottles of Malbec, your editor was ready to sing. At the request of his family, he only sings for guests. So, we limbered up for a stirring rendition of Johnny Cash’s “Folsom Prison Blues,” which everyone seemed to know, more or less. About an hour away is a winery, a bodega, where our wine is made. We have grapes, but no winery. So, we send our grapes – 46,000 pounds of them this year – to Raúl to have them processed and bottled. To get there, you drive down the valley as if you were headed back to civilization and then take a turn to the left. This is not a road you’d want to take at night… or after you had been drinking. It moves along, without hitch, through the desert, rising gently as you approach the crest of a hill. Then, all of a sudden, there is about a 500-foot drop down to a jewel-like farm, with fields of grapes and pimentos, a few farm buildings, and a river with a small bridge over it. But you have only a second to notice. You turn the wheel hard to the left to avoid going off the edge. Then, you hug the side of the cliff on a single-track road chiseled into the side of the rock. It takes about 15 minutes to weave your way down into the valley on the other side, all the while wondering what would happen if you met an oncoming truck. The Fake News loves to talk about approval polls these days. But once the story of this mysterious red liquid breaks… You may never hear the mainstream media talk about approval polls again! That’s because when the world finds out what this stuff can actually do… We predict that Donald Trump will get the highest approval ratings in history. This is an incredible win for Trump. Get the full story by clicking here. Raúl is a young man whose family has been in the valley for 300 years. His great-, great-, etc. grandfather was one of the original settlers and a territorial governor who once owned a huge part of the valley. When he died, his body was left there to dry. Then, it was put in the church in Molinos, desiccated but in full dress uniform. There, it remained on exhibition behind the altar, until recently. Raúl came to live in the valley when he was seven years old. His father had been in the Argentine military. But when the time came, the family came back to take up the family enterprise. At one time, the Calchaquí Valley was a productive part of the Spanish possessions in this part of the world. It had been worked by the Diaguita people for thousands of years. Then the Inca conquered the area and instituted a system of sharecropping and forced labor. The Spanish added their own bells and whistles, but continued the traditions established by the Inca. It remained unchanged for three centuries. But around the time we arrived – 10 years ago – life in the valley was already evolving rapidly. Government handouts were turning the sturdy, independent people into welfare addicts. Rural electricity, using solar panels and batteries, brought electric lights and satellite TV to the mountain people. When we arrived, the people on the ranch were still required to work for the owner for three months. They were paid for the work, but at a low statutory rate. We judged the system unworkable. The people were already in revolt over the forced work system. And we didn’t see how it could be managed anyway. So, we gave it up in favor of fewer, better-paid employees. That may or may not have been a good idea. At least the forced work requirement gave the local people a connection to the ranch. Since then, many have lost almost all attachment. They come. They go. They don’t pay their rent. “It’s a political problem,” Raúl reported. Raúl has seen plenty of trouble in the valley. The price of wool collapsed; sheep became unprofitable. Then the market for mountain cattle practically disappeared. Droughts. Windstorms. Floods. Frosts. Hardly a year has gone by without some kind of calamity. “Your grapes were exceptionally good this year,” Raúl said cautiously, as though he expected the roof of the bodega to fall down at any moment. High. Dry. Remote. We don’t get the kind of diseases that grapes lower down suffer. And our grapes run no risk of overwatering. We begrudge them every drop of water. They turn every drop into rich fruit. Then Raúl turns them into wine. A retired military officer and former ranking defense executive in the Middle East has revealed what could be America’s new secret weapon… The story alone is worth checking out, but the potential profits that investors could make are even more astonishing. You have to see this. “It’s amazing. I make wine for you. For the Swiss couple. For the people up the valley in Luracatao. And for myself, of course. We went from tank to tank, drawing off a little of the 2017 harvest. All were the same grape – Malbec. All the same year. All the same valley. But each was distinct in its own way. Then we entered a room off to the side, away from the large stainless steel tanks. There were the oak barrels we had imported from France. Raúl doesn’t usually put wine in oak. He believes it distracts from the taste of the Malbec grape. But we decided to see what would happen if we “oaked” the wine. It has been in the barrel for a year already. Raúl inserted a vacuum pump into the cask and drew out enough to taste. He drained it into a glass and passed it around. The oak was unmistakable. It had changed the taste of the wine. We couldn’t say. But it was definitely different. More buttery. Smoother. “Hmmm… I think this is nice,” Elizabeth pronounced judgement. But by then it wasn’t the taste of the wine that attracted us, it was the smell of meat roasting over an open fire. “Hey, it’s the end of the harvest. We always have a big barbecue to celebrate,” Raúl invited us to stay. It was a typical Argentine asado. Lamb followed beef… and one bottle of wine gave way to the next. The bodega workers and grape pickers sat with us at a long table set up on the shady side of the bodega. We ate. We drank. We joked. We laughed. Then, in the late afternoon, it was time to go. “Wait… you’re not going to drive up that hill, are you?” asked Raúl, pointing to the death-defying cliff. “I’m going to close my eyes,” Elizabeth added. It’s the moniker the press has given to the rally in U.S. stocks under President Trump. But dig deeper, and you’ll see that U.S. stocks have been laggards on the global stage. Today’s chart tracks the gain for the S&P 500 versus different overseas countries’ stock markets since Inauguration Day. As you can see, the S&P 500 is up 5.5%. But the Mexican stock market is up 21%… the Spanish stock market is up 18%… and the Indian stock market is up 17%. 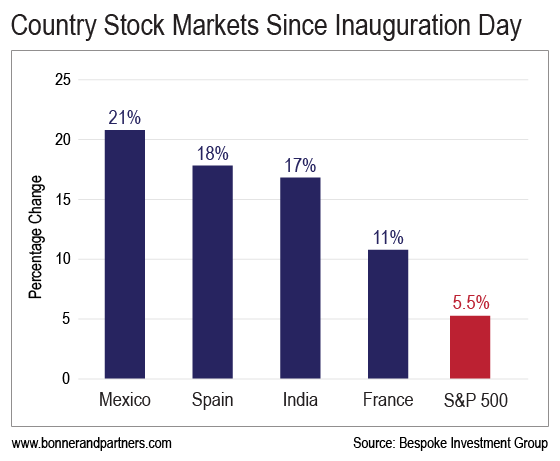 Even the French stock market has left the U.S. in its dust since Trump took over the reins in Washington. It’s up 11% – double the return of the S&P 500. On Monday, Treasury Secretary Steve Mnuchin hinted again that 50-year bonds could soon become a reality. Wall Street seems opposed, but Mnuchin has his reasons. In the dark of the Nicaraguan countryside, Bill reveals to his top analyst his secret for securing long-term wealth. Your article is one of the most profoundly ignorant messages I’ve ever read. Your name should be Whirling Dervish of Nincompoop rather than Bill Bonner. And if anyone had a “craven heart,” I tend to think you’re not that different from the Trumpster. The whole world knows why Bonner fantasizes and loves Trump so much. You and he are precisely the same. Poltroons. Your continued tirades about Trump’s foibles are becoming tiresome. I don’t see how we can stop the rich from getting richer. We increase their taxes, they get richer. We cut their taxes, they get richer. We put a luxury tax on yachts (Bill Clinton), they stop buying them, and the workers who build them lose their jobs. You are beginning to sound like Warren Buffet. If you and Buffett are so upset that the government has not taxed you enough please convince him to join you in donating all of your hard earned wealth to the Feds so you can both go into your after-lives happy as clams. You don’t need to know the future if you understand natural law in order to know what is best, or at least, good, and what is bad. Such as: a false weight and measure, as in a debased currency, is an abomination to the Lord; and debt equates to slavery. Bill, you and I both know that America is already bankrupt! 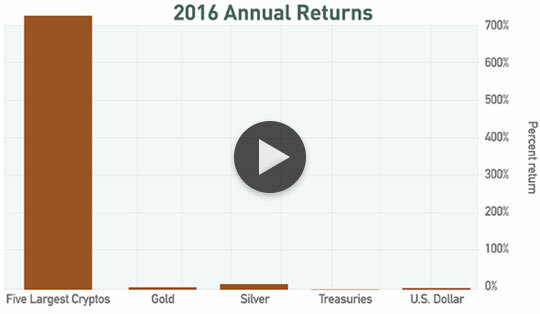 Cryptocurrencies were some of the best-performing assets in 2016. The five largest cryptocurrencies shot up an average of 730% in the last year alone. And Teeka believes that three unstoppable trends will push these little-known assets higher in 2017. Learn more here.